They say that everything happens for a reason. I once believed this with complete certainty. The logic made sense to me at the time. But now I wonder if it is up to us to create a reason or a purpose for things that happen. Which comes first, fate or the egg? Awareness or the chicken? I may be less certain if there is a divine force guiding the world and deciding our fate, but I am more certain that it is up to us to choose how we perceive occurrences and how we decide to react towards them. Maybe it was fate for me to choose to stay in Vientiane Laos a day longer to paint a wall. A spontaneous decision which ultimately caused me to be on the same bus as a girl unknowingly facing death, while on our way to a small town which would soon experience a flood. Or maybe it was the unexpected occurrence of finding myself in the middle of a flood, with a woman who needed care, which caused me to feel that it was fate for me to be there. Philosophical reasoning aside, the last few days have been quite an adventure. 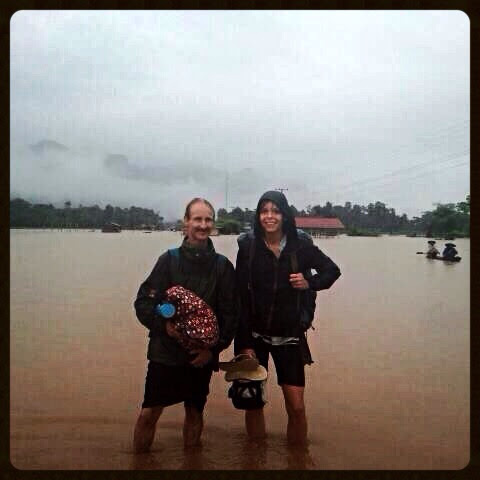 Nugget had already made her way north when I last met with her in Lauang Probang, Laos. She had told me to visit a fantastic cave in Ban Kong Lor, which I decided was a fantastic idea. From the capital city, Vientiane, I hopped on a bus to arrive in the small and beautiful valley where the cave was located. There were only a handful of other travelers with me, one of them being a woman who told me she was feeling ill. We all checked into one of the only guesthouses in the area with plans to see the cave in the morning. Our plans became a fantasy when the torrential rains began to pour. I woke up in the morning to find the roads slightly flooded and the power down. We were told that the caves were too flooded and we would need to wait a day for the rain to stop and the water to recede. We stayed the day, but the rain never stopped. It was that evening when myself and another traveler became aware of the sick woman’s severe condition. Still unknown to me, she had multiple severe infections on her leg which were giving her blood poisoning, a life threatening sickness. I had assumed at this point she had Dengue Fever, still life threatening but not as critical. By the next morning it became clear that we weren’t going to see the caves, the weather was only going to get worse, and we needed to get the girl medical attention. 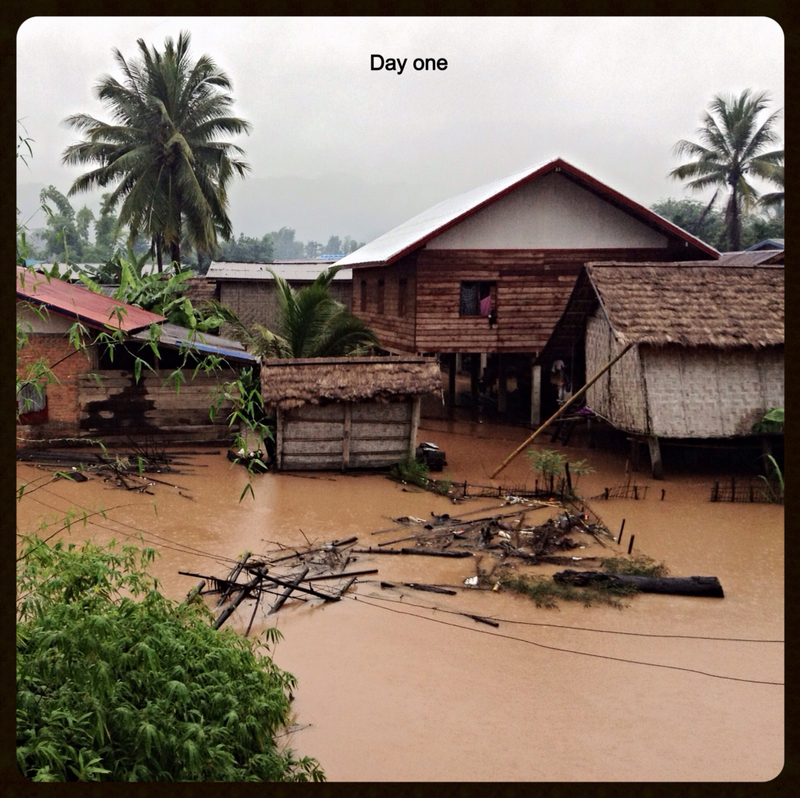 On day two we negotiated a simple plan with a couple of local guys who owned a tuk tuk and a boat. 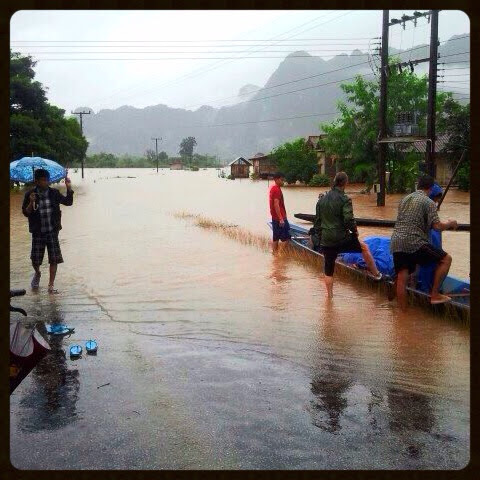 It would be simple, we would take the tuk tuk as far as we could, hop in the boat, and we would get out of the flooded valley in a few hours. We were all wrong on it being a simple process. The first half of the plan worked out smoothly. 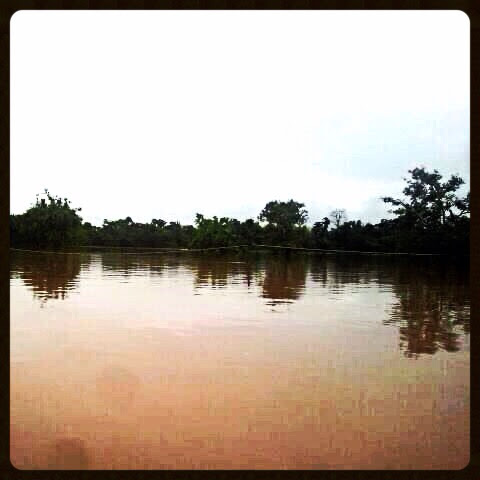 The farther we drove out of Ban Kong Lor, the higher the flood waters got. It seemed a fun novelty at the time. The locals were taking advantage of the extra rivers and were fishing in the roads. Soon the time came where the tuk tuk could no longer drive through the water, so we brought out the boat. There were ten of us trying to get out of the town that day, and the boat only carried 5. It was decided that the sick woman would go first, and I happened to get included in that group of four other travelers. 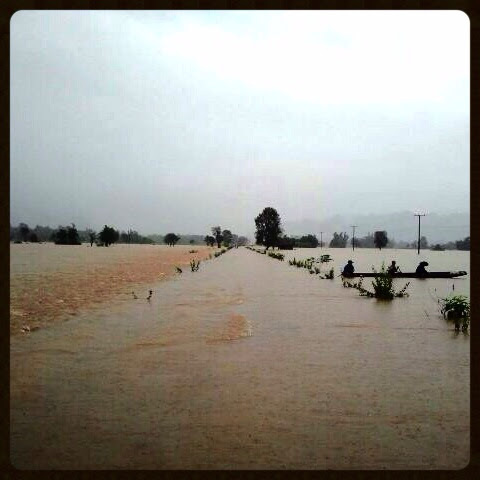 As we started off, we were in awe of the amount of water that covered the rice fields and road. 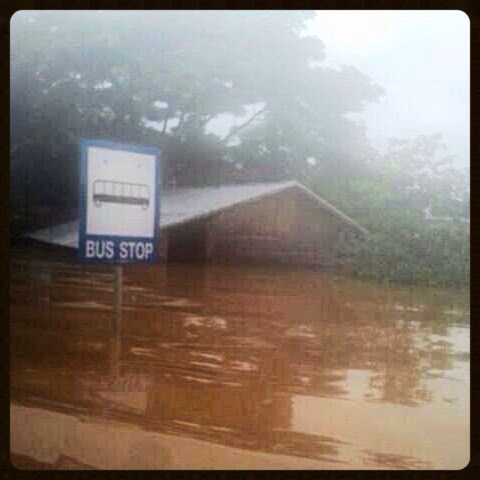 Only two days before we had driven a bus into the town where we now required a boat to exit. After about an hour on the boat we came to a small bit of high ground which formed an island of road and houses. The driver couldn’t find a way to go any further so he dropped us off with instructions to walk as far as we could and wait for the second group to join us. By this time our patient wasn’t doing so well, she was hardly able to step out of the boat let alone walk for very far. It was with her pant legs rolled up to avoid getting them wet where I first saw the sight of her infected legs. A couple of weeks before I had googled information on staph infections, confusing Staphylococcus with ring worm at the time, and I had seen pictures of mild and severe cases. This woman’s legs were undoubtedly on the severe end of the spectrum, and I knew the severe end of the spectrum meant deadly. Thanks to my nurse mom, I also knew that Staphylococcus and other wound infections required antibiotic treatment. By the look of her legs, coupled with the presence of a scary high fever, I knew that she needed antibiotics immediately. The damp wet environment we were in would only worsen her condition, which was already life threatening. But we were stuck on a small bit of island with cows, rain, and chickens, but no medications. Well, except for the antibiotics in my pack which my nurse mom sent me off with. Fate? I don’t know, but I do know that the antibiotics didn’t hurt the situation, nor did my awareness and decision to be concerned for a fellow person. After waiting for 2 hours, we found another boat which would carry two people out of the flood and possibly to safety. It was quickly decided that the sick girl should take the opportunity to leave, accompanied by someone to help her. A new friend of mine who had also taken the girl under his wing opted to join her, while myself and two others stayed behind. We waited another two hours before officially deciding that the boat wasn’t coming to get us. A small part of me almost wishes we chose to stay on that small island with a nice local family who offered their home to us for the night. It would have been a fun story to tell. But perhaps it was fate whispering, because we decided to walk forward despite the warnings from others that the water only got higher further on and we would be swimming by nightfall. With our packs lifted high on our backs we trudged through the shin deep water, then the knee deep water, which quickly became waist deep water. Just as we were realizing that we were crazy for doing what we were doing, our boatman finally found us. The hour long boat ride from our pickup point is one that I am unlikely to forget. The water quickly appeared to rise higher and higher the further through town we got. The rain never stopped and unfortunately my camera became too fogged to capture the images I witnessed. Entire houses under water, families on roofs, cars submerged, boats filled with electronics, water buffalo drowning, people clinging to bamboo, and all of the smiling faces. Yeah, you read that correctly, the people were grinning. 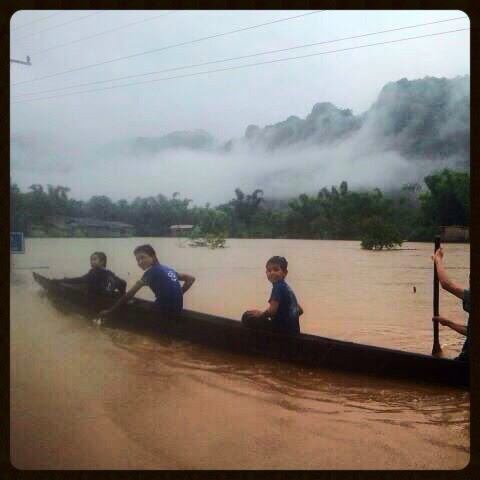 I don’t know how, I can hardly comprehend why, but the people we passed in our boat were smiling. Their fields were ruined, their homes trashed, their animals dying, but they still had time to laugh. Perspective, a beautiful lesson on mood. We eventually arrived to high ground where after a 6 hour adventure we finally met up with the rest of the group, our sick patient included. From there a tuk tuk brought us to the nearest town. I could write another whole blog post on the conditions of the hospital we eventually brought our ill friend to, but I’ll sum it up with telling you that it seemed safer to leave the hospital than be there. After consulting a doctor in Australia, it was confirmed that her condition was indeed life threatening. We were told to get her out of this country or to get her immediate antibiotic treatment through I.V. One person alone wasn’t enough to convince the doctors at the Laos hospital to give our friend the treatment she needed to save her life. They kept insisting we wait one week for the test results, but the frightening reality was that she might not have had one week to wait. If there is one thing I’ve learned from this, it’s to avoid the need to visit Laos hospitals. Maybe I was meant to be in that flood to give our sick friend antibiotics and to then provide needed backup for further treatment. But I personally would give more of the credit to a girl named Ally, who helped me back in Thailand when I had food poisoning, an event I wrote about in a previous blog post. She reminded me of a simple human lesson; we should look out for each other. Even with cause and effect, it’s up to us to shape our perception and reactions. Awareness and movement is more powerful than fate alone. By the way, those are power lines. Dedicated to Vanessa and Greg. Love you guys. about. I am very happy that I stumbled across this during my hunt for something relating to this.